Well, one thing is done and over with. Come this late-summer I’ll be living in Roanoke, Virginia and working towards my MFA in poetry at Hollins University. Hollins was one of my top two choices and it ended up being my only choice (this is not the best year to try to get a graduate degree or a job, money anywhere is few and far between), but I think I’ll be happy there. I first thought about attending Hollins for my undergraduate degree, but the school was a bit too conservative (everyone wore pearls, everyone! ), so I nixed it off my list. I then discovered Annie Dillard’s Pilgrim at Tinker Creek and fell in love with the muskrats and frogs and mountains described in her beautiful philosophical nature-writing text. I definitely plan on finding her muskrats as soon as I can once I move up there. All in all, I’m excited. I would have loved to have gone to UNC Greensboro and worked with Stuart Dischell and Jennifer Groatz, but the chance to work with Eric Trethewey (Natasha Trethewey’s father) and Thorpe Moeckel will be amazing. As nature-obsessed poets, I know I’ll learn a lot from them. So hooray, one piece of my life is decided! Another major piece of my life (well, since I read about it over at Smitten Kitchen) was successfully completed on Saturday morning: veganizing Deb’s migas with tomato-chipotle coulis. Eggs & chorizo? No problemo. The recipe is really quite simple. It seems a bit daunting, but even making my own homemade tortilla chips was quite easy, given my mother’s awesome 1970s Fry Daddy that I stole from her the last time I was at her house. Seriously, the seventies brought so many wonderful, strange things to home-kitchens everywhere! I substituted one recipe of scrambled tofu for the eggs, Trader Joe’s soyrizo for the chorizo (I wish I’d had time to make my own, like my chorico), and the rest of it was the same as the original recipe. And most seriously, make your own tortilla chips if you can. It’s worth it for the satisfying, salty, thick crunch of freshly fried corn tortillas. So so so good. All of my omni-friends loved the recipe, and while it might have been a bit hot for some, I thought the heat level was perfect. I love me a good chipotle recipe! Puree all of the above in a blender jar. Heat a sauce pan over high heat. Add oil to coat. Once the oil it hot, add the sauce. Cook for 15 minutes or so and season to taste. First, start the scrambled tofu. Mince 1 onion and cook in 1 tbsp oil in a large skillet (5-7 minutes). Once the onion is tender and translucent, add 2 minced cloves of garlic. Cook for 1 minute. Add a spice blend of 2 tsp cumin, 1 tsp thyme, 1 tsp paprika, 1/2 tsp tumeric, 1 tsp salt. Cook for one minute. Crumble 1 lb of extra-firm tofu into the onion-spice blend and cook for 15-20 minutes over medium-high, or until the tofu is firm and ready to eat. Next, add the soyrizo. Stir the soyrizo into the tofu and add 1 tbsp oil. Cook for 5 minutes or until the soyrizo has absorbed the oil and is cooked through. Add the chips to the mixture and break them up slightly. Cook for 1 more minute. Set up four plates for serving. Ladle some coulis in the bottom of each dish, top with some of the tofu/soyrizo and sprinkle with the cilantro. Serve immediately. Congratulations on the life decisions!! Congratulations on getting grad school sorted out! And also welcome to Virginia (when you get here)! And the migas looks delightful. 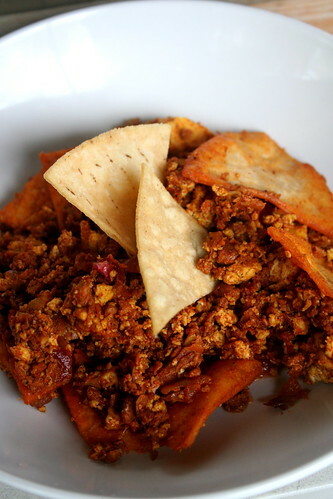 I’ve never had migas before but I’m always looking for a use for soyrizo and this one looks very yummy. Stalk stalk stalk…hi! Good to know another new admit. Seems like there’s only two of us for now. When will you be moving, and where are you moving from? I just realized that I’ve been making a fool of myself by telling people that Eric Trethewey was Natasha’s husband. I’m not sure where to reply to. I guess I’ll reply to both our blogs, and say CNF. Feel free to email me if that will make it easier. Are you a poet? Sounds wonderful! Will have to give it a try, in future weeks. Congratulations on getting in and on deciding to do it. It’s a good time to be in school, I think. i too love me a good chipotle recipe! thanks, Jes! never thought to make my own tortilla chips – totally gonna have to give it a whirl! i think we have a fry daddy stashed away somewhere in our attic! w00t! hooray for Hollins University! that’s most stellar! if you love nature you’ll love Roanoke. (i grew up in lynchburg – which is about 30 minutes away from Roanoke.) the mountains in the area are amazing – and even though parts of the area aren’t quite as “up to speed” as some parts of the country may be – that’s actually part of the charm! it’s relaxing, laid back, and oh-so lovely there! i think you’ll really enjoy it! yay! Hey! Congrats on having the school thing chosen, over and done! I look forward to hearing what your MFA is like. I’ll send you pearls made out of garbanzo beans. You’ll fit right in. that sounds like the perfect breakfast. and congrats on your decision to go to hollins! i thought about going there for undergrad as well…but didn’t for the same reason as you (plus, money). you’ll love working with poets you admire, i’m sure! It look really yummy. There is only one place here in Austin that does tofu migas and it kills me since migas is the most popular breakfast dish. Its so good! Now you are going to have to get some pearls, and while you are at it maybe a Jackie O ensemble. So exciting to have final plans! that part of virginia is lovely. you’re smack in the middle of a bunch of universities so vegan options shouldn’t be a problem. i did well in staunton & charlottesville. and yeah, i’m totally in favor of anything involving chipotle. it’s like sesame oil…always makes my mouth water. Congrats on your grad school decisions! I have to admit that I never heard about this dish before, but now I want it because it looks spectacular! Congrats! I know that I personally feel better just knowing that I have a clear path/more direction in life, so I hope that you’re feeling relieved and happy as well. And as always, it looks like you’ve got some good eats going on, so things must be pretty okay at least! YAY! I hope you have the time of your life in Roanoke! It sounds like a great decision and Hollins sounds like a great school! You don’t have to wear pearls, do you? Your food looks (guess what word is coming up…) delicious!! I think Coulis is now my favorite word. Congrats on the decision! The migas look deeeelicious! And your chipotle-tomato coulis is making my mouth water. Yum! And I’m sure you’ll like Hollins!